Hello, after spending some time in the Phoenix, AZ area I decided to upgrade to a 15000 btu roof A/C from the 13,500 unit that came factory installed and hope this will improve the cooling enough in our 3100 PC so it is tolerable in hot climate....I have seen a few PC's that have two roof A/C but know it would be too spendy to put 50 amp service in my coach. Re: unsatisfied with performance of Air Conditioner? We have a single Coleman Mach 8 (15000 BTU) in our 2552. Our experience in very hot weather is that it will cool down the rig 20 degrees below outdoor temps, so if it is 100 degrees out there we can only assume we will have an interior temp of 80. We do have double paned windows, but have not done the best job of insulating for very hot or cold weather yet...just one of those reflective windshield panels. We will definitely be putting together some additional items for insulating the thing..... Cab area side window panels, panels to cover the fantastic fan openings, etc. The coach door seems to be a major source of heat in the summer and cold in the winter, so we are making an insulation sheet to cover the door (and around the frame) and installed with Velcro. A lot of infiltration comes from the bathroom skylight as well. We also notice a positive difference when we turn the cab a/c controls to recirc before shutting the engine off. Lastly, finding a shady site helps, or at least a site that has the sun on the side that does the most good....for us, we generally want to be able to block the sun with our awning which helps keep the rig cool and provides an outdoor shady site to relax. There is a significant difference in our rigs size compared to yours. I would expect a positive difference by upgrading to a 15000 BTU unit, but I think you'll need to insulate as well. Thanks for the reply Mike, your suggestions all sound like they might help...we thought maybe we could shut the sliding door to the bath area to make the inside smaller, don't spend too much time in the toilet during the hottest part of the day anyway...I found a great deal on an Atwood 15K with heatpump and it seems to move a lot more air than the original Penguin ll unit. Karl. You cut out pieces of this stuff just slightly larger (1/4 inch or so) than the dimensions of a window and just pressure fit it into the window frame on really hot days, then you pull all the curtains or close all the blinds as the case may be. For the front part of the cab, the side windows and windshield is the culprit. You make the cutouts a little larger on the side windows on two sides and bottom and a little smaller at the top leaving a gap at the top and you lower the side windows slightly (1/4 or 1/2 inch) thus providing an escape hatch for the hot air. The windshield can most effectively be dealt with from the outside by using one of the commercially available covers available. Instead of shuttering the vent fans, try cracking them slightly. That will allow hot air to exit since hot air rises, cool air settles. One of the reason we got away from our beloved Roadtrek was simply the heat making summer camping in it a sometimes impossible situation on bright sunny days. This Reflectix stuff is cheap and can be purchased in various size width rolls at Lowes or HD. You might give it a try and see how you like it. By the way, all those cutouts of Reflectix we stored by simply putting them under the mattress. The stuff is only about 1/4 inch thick. You can also use it to line other areas that have heat problems, like the back of cabinets that get hot from the outside walls. When you are in those extremely hot temperatures, are you staying in that camp site for weeks at time? If you are, it might be worth making a shade canopy that covers above and around the rig. It would take tall 2x2 poles in front & back, and shorter ones along the sides, roped-& staked all around. Big screws into the ends needed to set through the eyelets of the tarp, and for the ropes to attach to. You might have to make a stand to place on your PC roof to hold up the middle if it sags. You'll want the a/c unit to breathe, allowing the heat to escape out the ends of the gable. At a family reunion, my cousin setup such a canopy using a huge cheap tarp which provided massive shade for everyone. It was so big that you could surely park a PC under it. I just did a quick search and found THIS ONE. If it works well but does not hold up well year after year, then buy something more durable. I would first set it up in your back yard at home to learn how it's going to work in a camp site. Of coarse such a canopy would be vulnerable to strong winds so keep that into consideration. It is just a thought, not a proven idea for covering a PC. 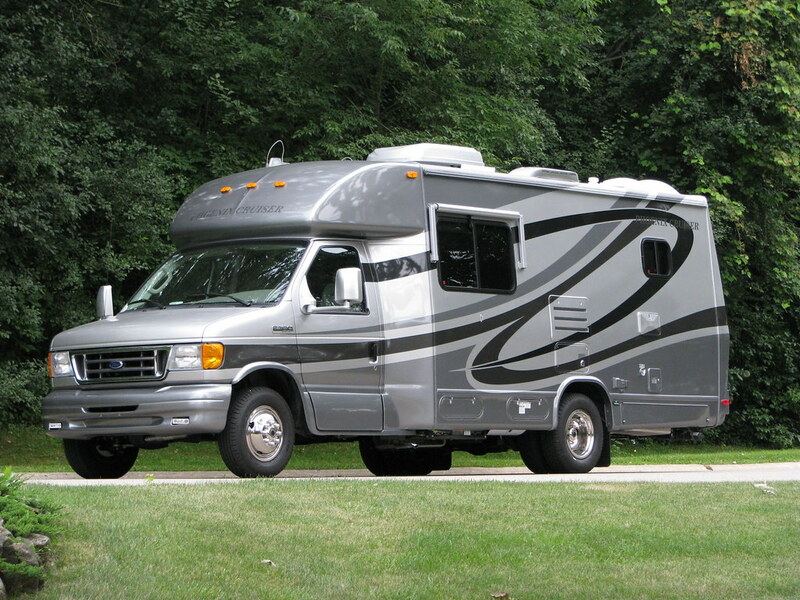 Adding reflective insulation on all windows is effective, but that would turn the motor home into a cave. I am just tossing out the canopy idea to avoid blocking out the light and to keep the sun off the entire rig. Unfortunately the blue tarp I linked to will surely provide a lot of blue light inside. A white tarp would be ideal, and cooler too. There are also window shades available for the windows on the left side of the rig. We have one for our dinette window, shown here in the "stored" position. But the sun still beats down on the over-all motor home. Yep! . Besides the Coleman, our largest benefit was to insulate both the cab area and the coach door. Our next PC will definitely have two Coleman A/C units, because we do spend a good amount of time in areas close or above 100 degrees. Some of the things used to calculate heat load are. Room size, number of people in living area, amount of insulation, amount of window area, what part of the country the home is located, and a lot more.